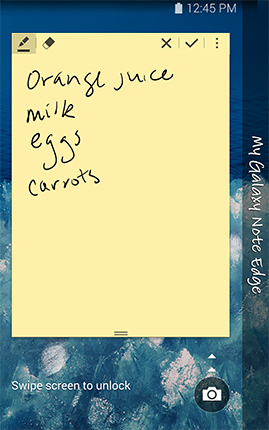 Quickly create S Note™ memos using your S Pen™, even while your device is locked. The Action Memo™ on lock screen setting is available with all five lock screen types and is turned on by default. 1. Press the button on your S Pen and double-touch the lock screen. 2. Use your S Pen to write on the memo screen. 3. To erase part of your note, touch and then touch the writing you want to erase. 4. Minimize the memo by touching More options > Minimize. If you unlock your screen while the memo is minimized, the memo will be saved to S Note and will not display on your lock screen again. 5. To create another Action Memo, touch More options > Create Action memo. The current memo will be saved to S Note and close. 6. Save the memo to S Note and close it either by unlocking the device or by touching . 4. Mark the Action memo on lock screen checkbox to turn on the feature. Note Edge: How do I insert or remove the microSD™ card for my Samsung Galaxy Note Edge?